The rent at The Century Apartments ranges from $2,100 for a studio to a $8,000 two bedroom. Apartments in this building are about 74% more expensive than the Columbia Heights average. This is a pet-friendly apartment. 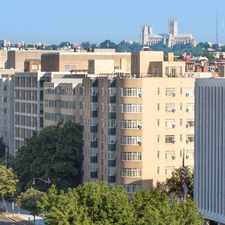 The Century Apartments is an eight minute walk from the Green Metrorail Green Line and the Yellow Metrorail Yellow Line at the COLUMBIA HEIGHTS METRO STATION stop. This apartment is in the Columbia Heights neighborhood in Washington D.C.. Nearby parks include Columbia Heights Recreation Center, Columbia Heights and Rabaut Park. The Century Apartments has a Walk Score of 96 out of 100. This location is a Walker’s Paradise so daily errands do not require a car. The Century is a Washington Apartment located at 2651 16th St Nw. The property features Studio - 2 rental units available starting at $2100. Amenities include Dogs Ok, Cats Ok, Dog Grooming Area, Pet Friendly Community, Pet Park, On-Site Laundry, and In-Unit Laundry. Contact us for a showing. Explore how far you can travel by car, bus, bike and foot from The Century Apartments. The Century Apartments has excellent transit which means transit is convenient for most trips. Car sharing is available from Zipcar, Hertz On Demand and RelayRides. 2651 16th St Nw compared to all of Washington D.C..
How do you feel walking near 2651 16th St Nw? View all Columbia Heights apartments on a map. The Century Apartments is in the Columbia Heights neighborhood. Columbia Heights is the 8th most walkable neighborhood in Washington D.C. with a neighborhood Walk Score of 94.